Fans of Coca-Cola—and the Mad Men finale—are getting a nice treat today. The soda company just announced that it has remastered and color-corrected its famous 1971 commercial "Hilltop" for 4K television. On March 25, I got a chance to work on perhaps Coke's most iconic commercial—the 1971 classic, "Hilltop." Filmed in Italy, the spot celebrates the diversity of cultures from all around the globe by showing people coming together to sing a song of unity. It was so popular that its soundtrack, "I'd Like to Teach the World to Sing," became a hit single. The original 35mm footage on which the commercial was filmed sits in a vault in the Library of Congress, where American culture is preserved. So what was I doing with the original footage almost 45 years later? Technically speaking, I was remastering the 35mm film for 4K Television, and color-correcting it. In layman terms, that means I was preserving an iconic gem for a new generation. In terms of quality, it rivals the footage that Matthew Weiner used in the Mad Men finale (when, spoiler alert, Don Draper had his breakthrough and went on to creative direct the classic spot at McCann). Coke clearly gave Weiner access to the original 35-millimeter film, though neither he nor the company has spoken in detail about that process—other than to say Coke didn't know much about how the ad was going to be used in the episode. I cannot even begin to explain what an honor this was for me. Sitting in a dark color-correction bay, I got chance to really study the footage. And even though the color might have needed some updating, I marveled at how this commercial continued to resonate with me and the world around me. I was reminded of how truly ahead of its time it was … and still is. 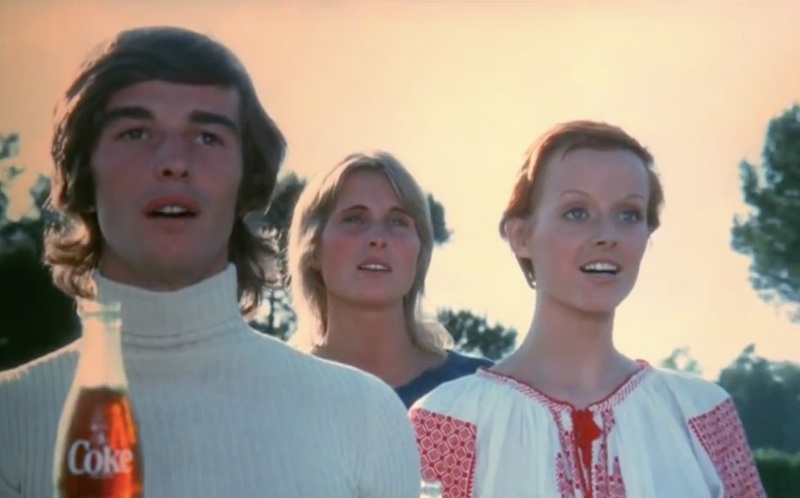 Forty-five years ago, Coca-Cola asked the world to come together on a hilltop in Italy. Today, as I sit in a dark room polishing this gem, I am reminded of our company's incredible advertising history. I feel inspired by my forebears. It has been an enlightening day for me, and I am humbled by the small role I get to play in all of it. I only wish I could share this moment with some of the original creatives. The remastering of old ads remains very rare. Among the few recent examples are this Pabst Blue Ribbon spot with Patrick Swayze and Gatorade's classic "Be Like Mike" ad.